WHOI scientists, Mindy Richlen and colleagues believe the macro algae to be Ulva, most likely U. flexuosa paradoxa. Species identification can be tricky because the morphology (physical form) of Ulva is influenced by environmental conditions. In 2008 the macro-algal bloom was identified as Enteromorpha clathrata. The genera Enteromorpha and Ulva are synonymous. Based on genetic information, these two genera were combined into one and are now referred to as Ulva. 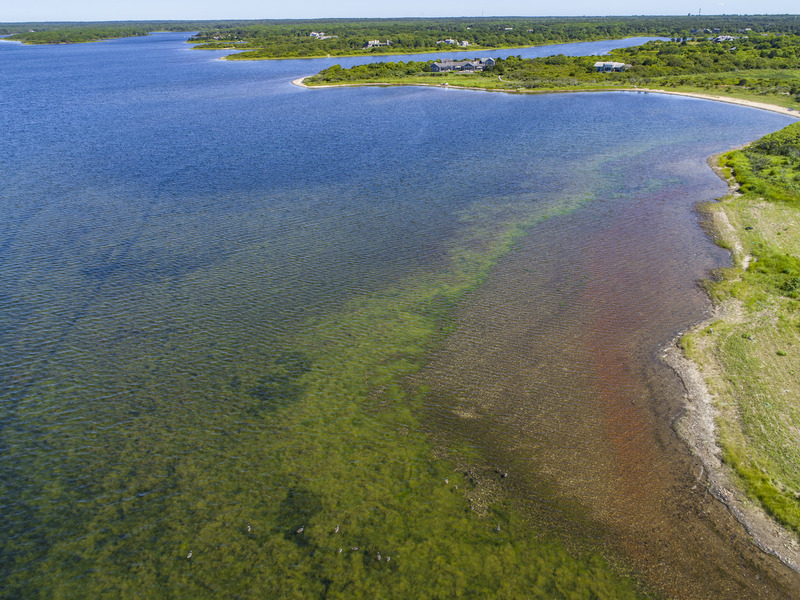 The Edgartown Great Pond bloom in 2008 and the current one are both from the same genus of macro algae, but are different species. 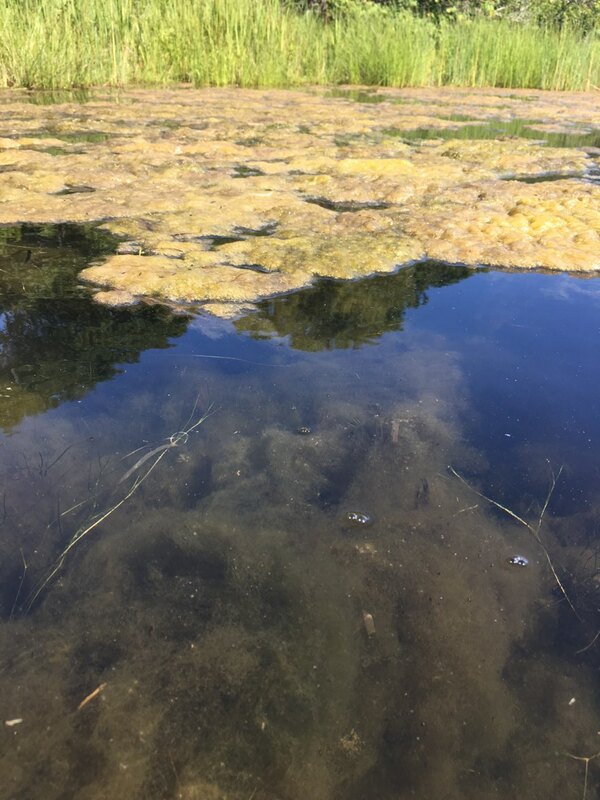 It is not unusual to see macro algae in Edgartown Great Pond, in fact, we usually observe small quantities of it each year. The reason we are concerned about the algae this year is because of the sheer quantity of biomass that is growing. Blooms of Ulva are sometimes referred to as a green tide. Although this species does not cause harm to humans, it can have an impact on water quality and the health of the ecosystem. When growing in the eelgrass as it is now, it can block the light needed for eelgrass to grow. When the algae dies, it sinks to the bottom of the pond and the bacteria that decompose it consume oxygen and create hypoxic (oxygen starved) areas. It follows a cycle where it grows heavily through July, then breaks loose and floats to the surface, buoyed by gases released by photosynthesis. Floating mats come onshore and when blown into drifts it can pile up quite densely. Dense mats are accumulating in the southeast corner of the Pond near Crackatuxet Cove. 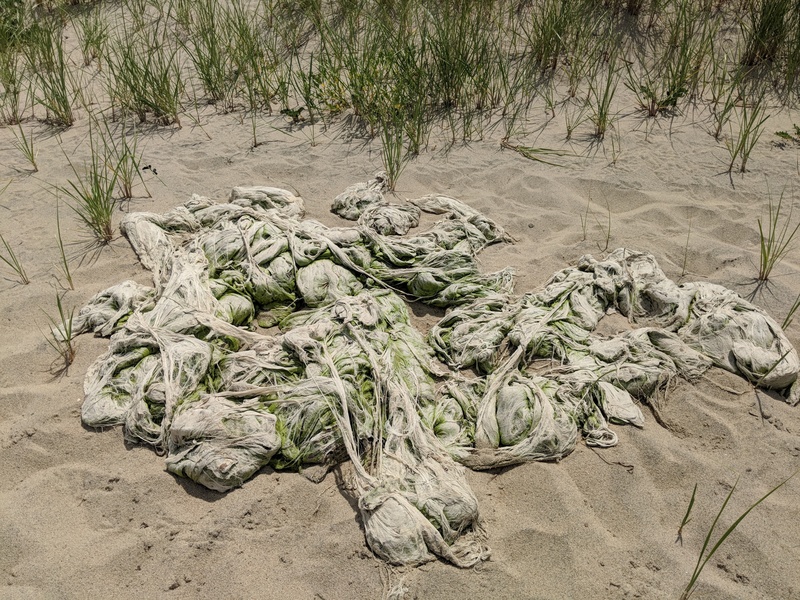 Per Paul Bagnall, Edgartown Shellfish Constable, the algae lifts off of the bottom and floats ashore when the predominant SW wind blows it to the east side of the Pond. Thanks to David Welch, we have some more incredible shots of the Pond and algae. 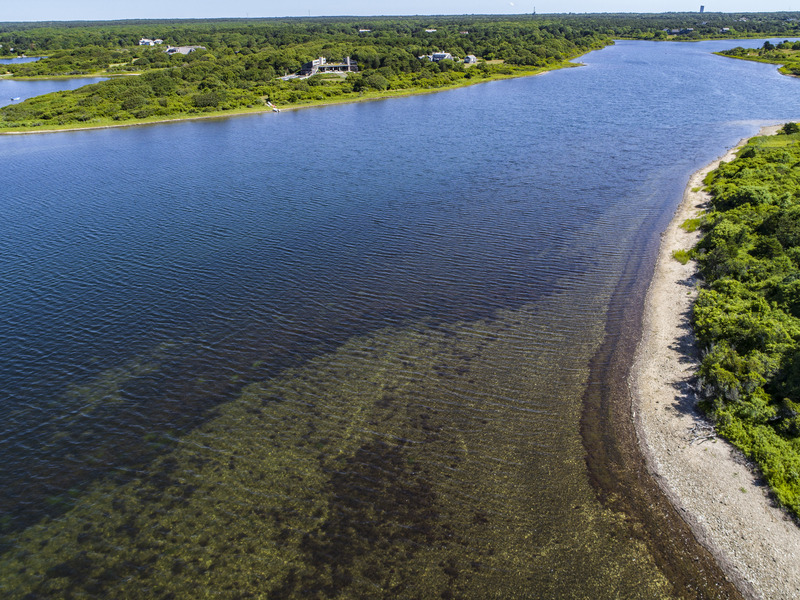 SE corner of Edgartown Great Pond, looking East. Courtesy of David Welch. SE corner of EGP looking South, sluiceway on the left. Courtesy of David Welch. SE corner of EGP looking west. Courtesy of David Welch. SE corner of Edgartown Great Pond, looking north. Courtesy of David Welch. West Point in EGP, looking north towards Slough Cove. Courtesy of David Welch. Algae extends West from the point on the South side of Slough Cove, looking N in EGP. Courtesy of David Welch. The algae continues along the SE shore of Slough Cove. Courtesy of David Welch. Although there is a bloom in the Pond, there is still good news for the overall health of the Pond. Per GPF data this year the water quality on the Pond is good in areas away from the bloom. Water clarity remains at 2.5-3 meters which is very good for this time of the year. Dissolved oxygen is high and above target in most areas with only a few exceptions. Last week at the water station closest to the bloom DO dropped to 4.0 mg/L instead of the normal 6-8 mg/L. 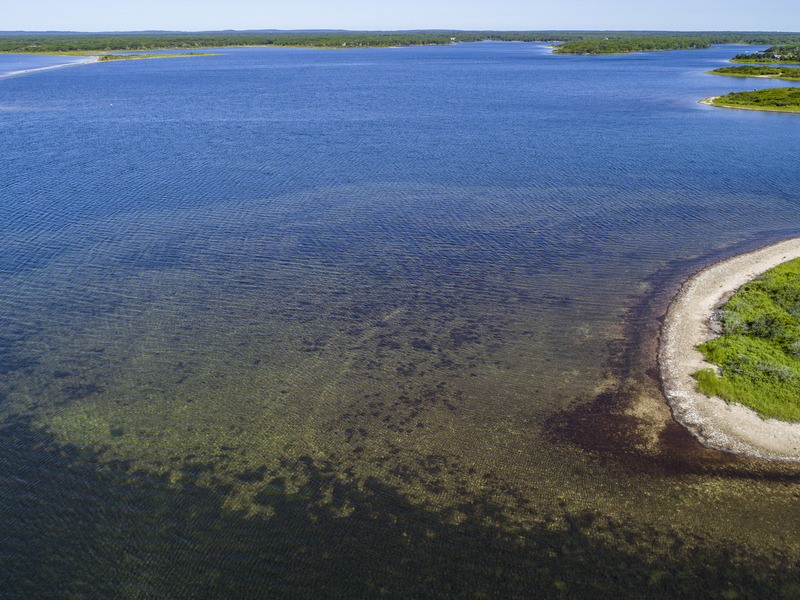 GPF will continue to monitor the water quality throughout the season and document any changes as the algae begins to die. At the moment DO levels in the algal mat areas are very high because the mat is still alive and is photosynthetic (H2O + sunlight = sugar + O2). There are a lot of data to support the improvement in water quality since the 2008 bloom and the release of the MEP report on EGP in 2008, including GPF’s February 2018 report. 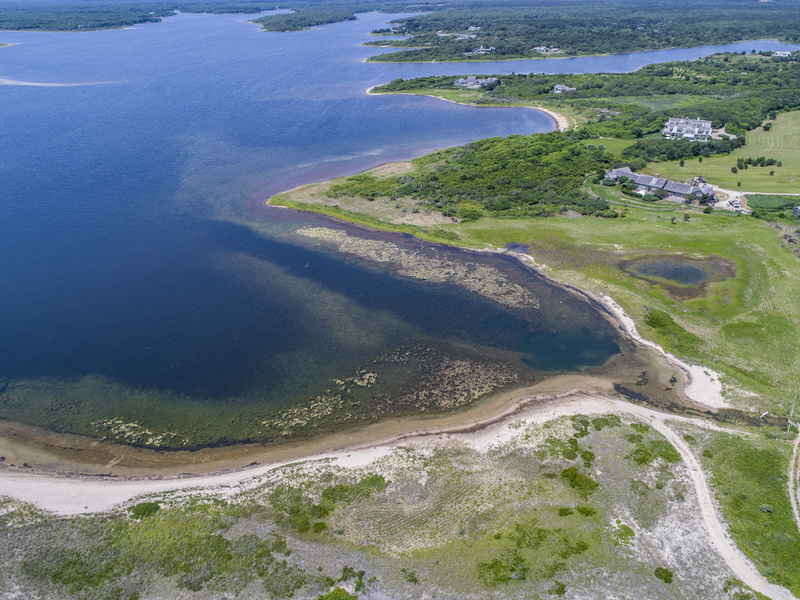 After a decade of dredging of the delta north of the “cut”, shellfish restoration, and carefully timed Pond openings Edgartown Great Pond is much healthier now than it was at the time of the 2008 bloom. 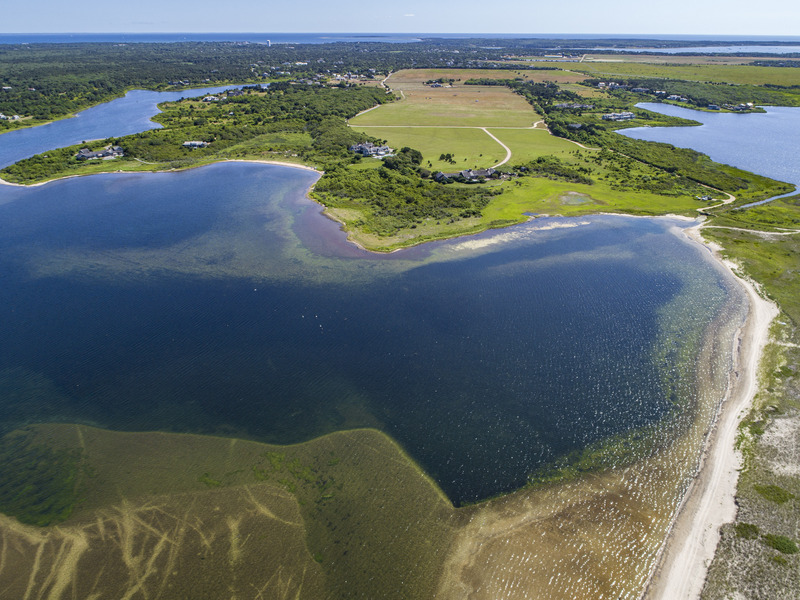 According to Martha’s Vineyard Commission data released in April 2018, total nitrogen in 2017 for Edgartown Great Pond was below the target (TN=0.5 mg/L) set by the MEP for the first time with TN=0.447 mg/L. This is great news for the Pond! Great Pond Foundation scientific staff documented that last week the nitrate reading was three times the normal peak levels for the Pond at the water station closest to the bloom (EGP6). This week the nitrate levels both EGP6 and in the SE corner of the Pond, where the bloom seems most concentrated, were within normal limits. Algal blooms are usually driven be an excess of nutrients in the water. 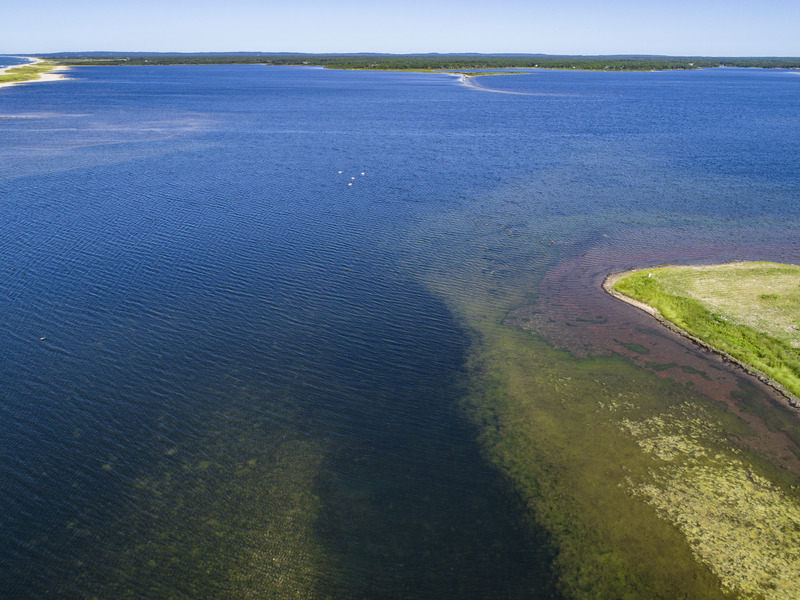 At this time we do not know what caused this bloom, but there was likely some sort of disturbance to the natural balance of the estuary that caused the dramatic growth of the algae. 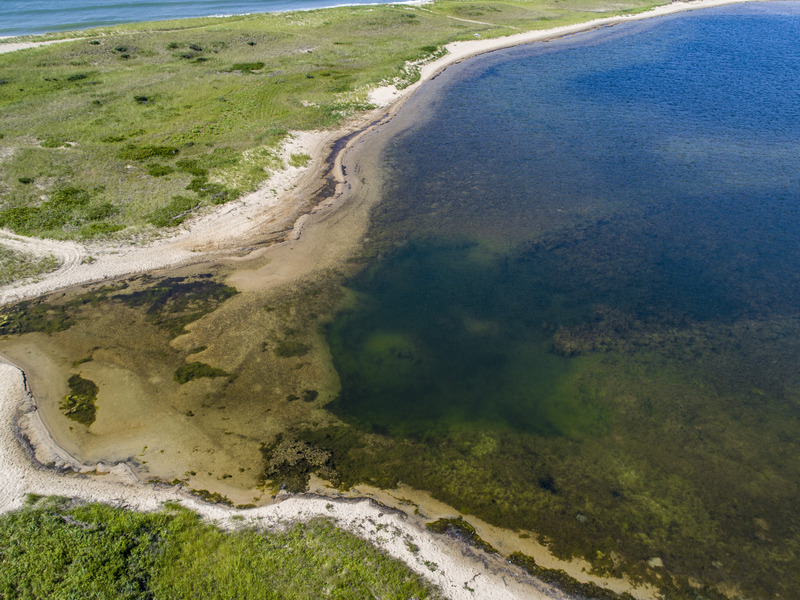 Great Pond Foundation will continue to collect data throughout the Pond and will work with the Martha’s Vineyard Commission and the Town of Edgartown to analyze the data in an attempt to identify the source of the problem and reduce the likelihood of such blooms from occurring in the future. Algae in EGP. Photo courtesy of Anne Mazar. 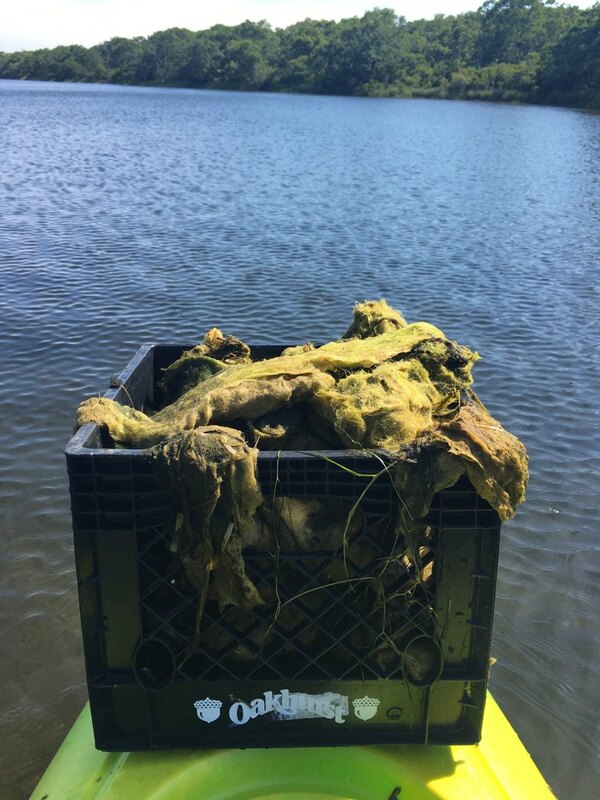 Algae compressed and removed from the Pond. Photo courtesy of Anne Mazar. 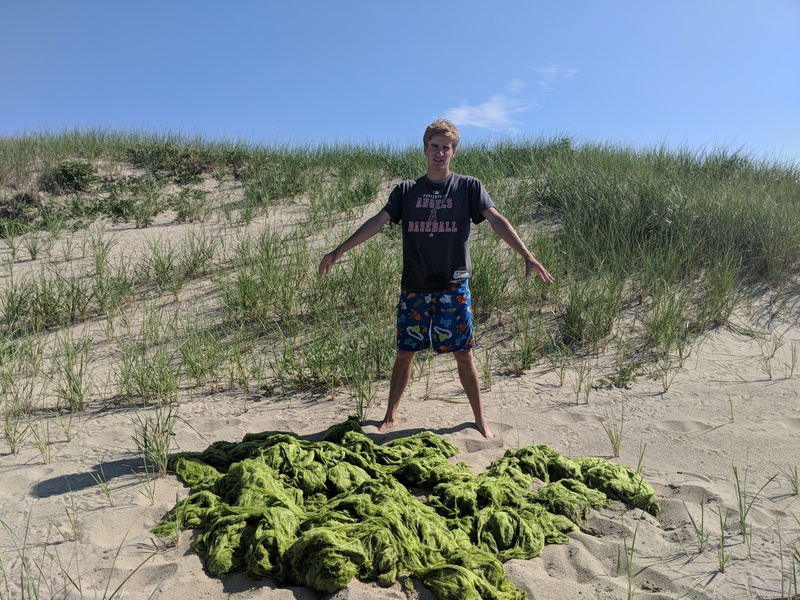 Sam Hartman shows you the size of the algal mats GPF removed from the Pond once the water was removed. Several days later the green mat fades to white. Check out the MVTimes article for more details.